'Secret Empire' TPB review — the story we need in Trump's America – AiPT! Secret Empire ... has not lived up to sales expectations. There’s a deeper meaning many don’t give it credit for. It all started innocently enough. When writer Nick Spencer took the duty as Captain America writer in 2015, he wanted to continue a plot thread the exiting creator, Rick Remender, had laid down — a major hero was secretly a Hydra double agent. The question then became, who should it be? Hell, why not Captain America himself? It’s something no one would expect, and it would have huge ramifications for the rest of the Marvel Universe. Go big or go home! Spencer and editorial had to expect there’d be some blowback. Captain America was a symbol of freedom created by two Jewsish men, whose comics debut had him punching out Adolf Hitler months before the United States entered World War II. But then it’s just a story, after all. People lost their minds at the beginning of Dan Slott’s Superior Spider-Man, too, when Dr. Octopus villainously took over the wall-crawler’s body and left Peter Parker to die in his place, but that became the highest-selling and probably best-regarded story of Slott’s 10-year run on Amazing. When the story that would become Secret Empire began to be formulated, though, in 2016 and probably even earlier, there was a lot of real American history yet to unfurl that not many people anticipated. Surely, it would seem, the writing and editorial staff of Marvel Comics hadn’t guessed that Donald Trump would be the President of the United States by the time Empire saw print, and that plenty of people would find parallels between the story and the genuine state of the nation. You can almost see it in the narrative of Secret Empire itself. The middle of it is just what Marvel PR at the time wanted to convince you it was — a pretty standard comic story of heroes vs. villains, with the good guys trying to find a way to overcome the always impossible odds of the supremely powerful threat, except this threat happened to wear a familiar face. Issue #4 forgets about politics completely, and is more a character study on the insane combination of Hank Pym and his murderous creation, Ultron. The beginning of Secret Empire shows a Captain America that is still hesitant about his role as Hydra Supreme Leader, reluctant to bring various hammers down and to execute his longtime (now treasonous) friend, Rick Jones. As time goes on, though, Hydra Cap becomes more remorseless, which could just go to show that he’s settling into the fascist dictator job. Or is it that, originally, evil Steve was meant to come to his senses in the end, and overcome the reality rewrite perpetrated by Kobik, the sentient cosmic cube? Did the real-life political climate that Secret Empire stumbled into make that … unsatisfactory? Starting in issue #2, we also follow the side story of a different Steve Rogers, with appropriately distinctive art by Rod Reis. It’s only a couple pages per issue so it could, conceivably, have been added further along in the publishing process than usual. It’s the story of a man lost and forgotten, trying to find his way back home. It’s an important message, perhaps more so now than when the event originally took place. If you don’t like the way things are, if you think this is not the America you believe in, we can rally and overcome this other thing that’s taken its place. But even if that happens, we must realize that the damage has been done, damage that no one will quickly forget. But overall, Secret Empire is a story of hope, and how important it is to keep some. Even in the resistance’s darkest moments, time and again when all seemed lost, a shred of hope kept them going, on their way to eventual triumph. The word itself is reiterated early and often by the unnamed narrator, and the concept is evident throughout the plot. Given its difficult timing, the narrative of Secret Empire can seem a little scattershot. The feeling of “heroes fighting villains” definitely seems to change to “citizens overcoming tyranny” at some point, which is probably what was needed, but is evident enough to make for some tonal dissonance. The inclusion of the Free Comic Book Day Secret Empire issue is nice, but it doesn’t quite fit with the overall story, more of a tangent than an integral chapter. The rotating art teams, something that’s more or less expected for a big event at this point, can also take you out of the moment, but if it’s gonna happen, you couldn’t ask for two better artists than Daniel Acuña and Andrea Sorrentino. Acuña does his best work with facial expressions maybe ever, and Sorrentino’s stylized, colorful backdrops just ooze emotion. Their work is so striking that it overshadows that of other superstar artists Leinil Francis Yu and Steve McNiven. Yu’s pencils seem uncharacteristically rushed, and McNiven’s careful realism feels almost plain compared to Acuña and Sorrentino. Matthew Wilson and Sunny Gho provide adequate colors, while Rachelle Rosenberg, who does nice work on Reis’ “Good Steve” sequences, also colors Jesús Saiz on Captain America #25. 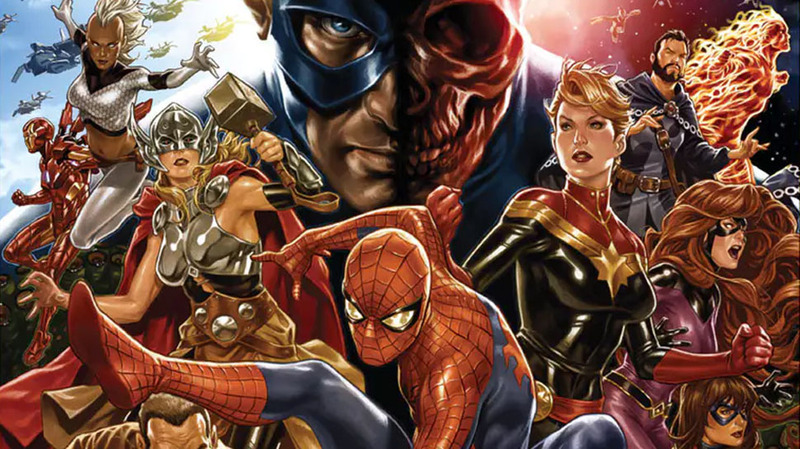 In many ways, Secret Empire is typical of a Marvel Comics summer event — the main book is a little confusing without the tie-ins, the art is done by committee and the outcome is never really in doubt. But it’s also unique and more important in how it was created, and what it means to the large number of people who feel disaffected and hopeless in America right now. A surficial analysis that “Marvel shouldn’t have made Captain America Hydra” misses the meaning behind Secret Empire — that even if the America you see now is not the one you identify with, there is still hope for the true face of our country to prevail once again. It’s a message those who hate the idea of Hydra Cap can probably identify with. It's probably as good as it could have been, given the circumstances, and its message of hope is important for people who feel disenfranchised right now. Some great art mixed with some more ordinary art. Is there a tonal shift partway through?